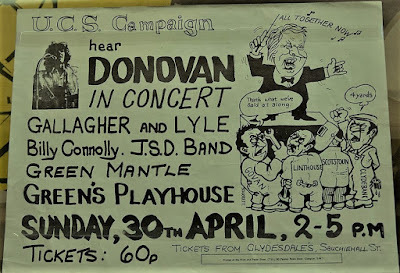 Shipbuilders, headlined by Donovan, at Green's Playhouse in Glasgow. At the time I was only vaguely aware of the reasons behind the fundraising. 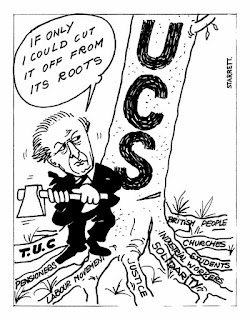 The UCS consortium had gone into receivership in 1971 when the Conservative Government refused to allow them any further credit; in response they had organised not a sit-in but a "work-in" to complete existing orders, shop steward Jimmy Reid declaring: "There will be no hooliganism. There will be no vandalism. There will be no bevvying ... because the world is watching us." 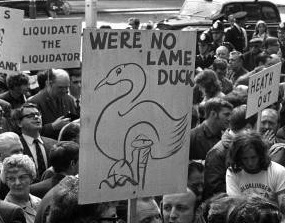 The government didn't want to subsidise "lame ducks" - a phrase used by the Secretary of State for Trade and Industry, John Davies - but mass demonstrations of support eventually forced them to back down, especially after a leaked memorandum from 1969 revealed it had been the Tories' intention to carve up UCS and sell off what was left even before they had been returned to power. Sympathy for the cause was worldwide - as suggested by the depiction below of Davies as "Heath's hatchet man" - and it's said that the day before the benefit concert John Lennon arrived at the yard gates with a bouquet of red roses, making a substantial donation to the fund in exchange for two tickets. I do hope that's true. 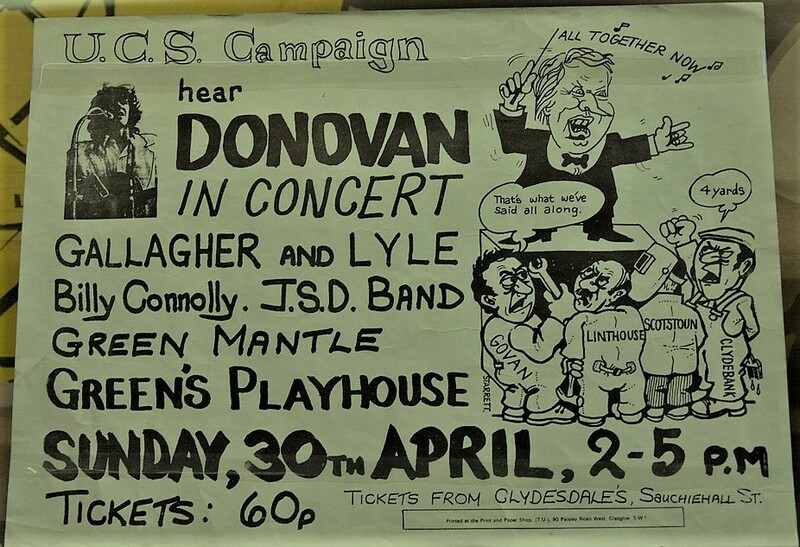 The compere for the show was Billy Connolly, himself a former shipyard worker, and among the acts were Gallagher and Lyle (from nearby Largs) and the JSD Band, whose brand of electric folk was getting them noticed at the time; I recall John Peel playing their version of As I Roved Out. 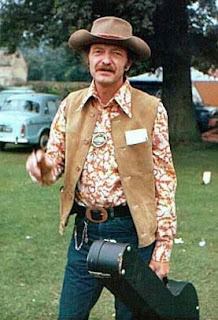 But the person who made most impact on me, other than Donovan himself, was undoubtedly Derroll Adams, the "Banjoman" addressee of Donovan's Epistle to Derroll, pictured below at the Cambridge Folk Festival later that year. He introduced Dylan to Donovan and can be seen in the film Don't Look Back, a benign and encouraging presence. 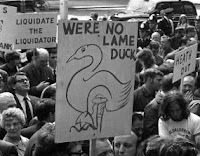 Adams was drinking heavily and, after a particularly ramshackle gig, found himself no longer welcome in English clubs. By 1969 he was seriously ill, but with the help of his third wife, Danny, he recovered and settled in Belgium. 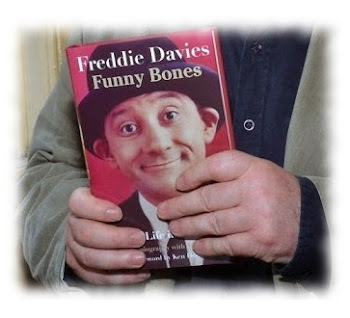 He was in England in 1972 for the Cambridge Folk Festival, and celebrated his recovery in a new album, Feelin' Fine. Er, I think you'll find that's pronounced Bel-gi-um, pal. But the main deal that day was Donovan. I had become familiar with his records through singles owned by my eldest brother, reinforced by my own purchase of a budget album whose cover I still see staring out from the window of a local newsagent's and toyshop - which must, I suppose, have sold records on the side. The lady with the pram in the photograph below, taken in 1966, is standing where first this vision was vouchsafed to me a few years later. 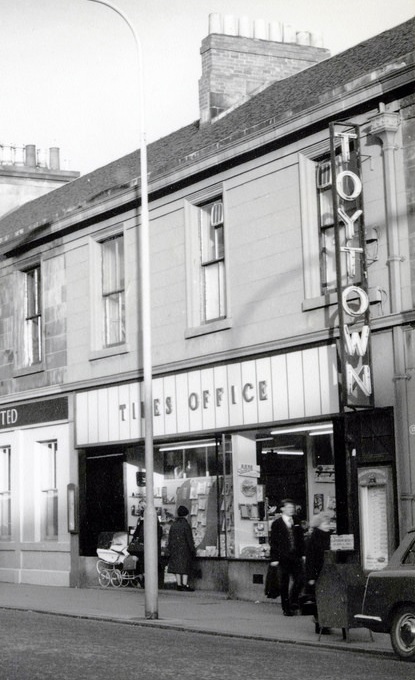 In case you're wondering, the premises, which had once housed the local paper, remained identified with their former function - a rare case, in the sixties, of The Times not a-changin'. 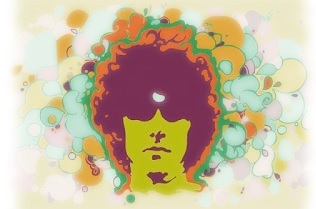 There is still, for me, something compelling about that image of Donovan, even though my adult self knows it's case of premature psychedelia, an attempt to pass off the Ramblin' Boy of earlier days as a fully fledged Sunshine Superman. I can't recall the day I strode into the shop to make my purchase, nor indeed buying anything else there, but it was an important occasion, nevertheless: The First Album I Ever Bought. Even if it was in a toyshop. Sitting in the dark of a packed Green's Playhouse, I was about to reach another staging post as Billy Connolly introduced our - well, our afternoon star, actually. Presumably I had only been permitted to attend because I wouldn't be walking through the centre of Glasgow dangerously late: one foot still in that toyshop. A bootleg was made, which I purchased from someone in Hamilton. The sound quality - at least in the cassette I was given - was truly atrocious, making it hard to discern anything. I sent it back, or sent a letter complaining about it, only to receive an angry phone call: he assumed I was a fellow bootlegger, trying to get something for nothing (the irony of that I'll leave aside, even though he sent me a list of his "unofficial recordings", which I now know were all well-known boots). I was about fourteen at the time, and he'd met me, so I don't know what kind of industry he thought I could possibly be the brains behind, though he did cool down once I managed to convince him I'd been voicing a genuine grievance and the conversation came to a rather abrupt, but at least vaguely apologetic, halt. Still, it means I don't have any record of that first concert beyond what has lodged in my memory. The reason I had complained, incidentally, instead of ruefully accepting that I'd been done, wasn't so much out of some juvenile sense of right and wrong as the fact that, eager to maintain a customer base, he had sent me a Christmas card saying "Hope you liked the tape!" 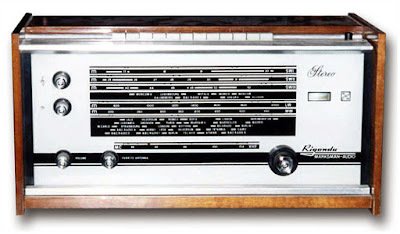 Well - as you know - I didn't, but if you ever read this, I would really love to hear it again now, whether or not technology has allowed for some mini-miracle of audio restoration in the meantime: just let me fire up the ol' long-vanished Rigonda and I'll fill in those missing frequencies for myself. 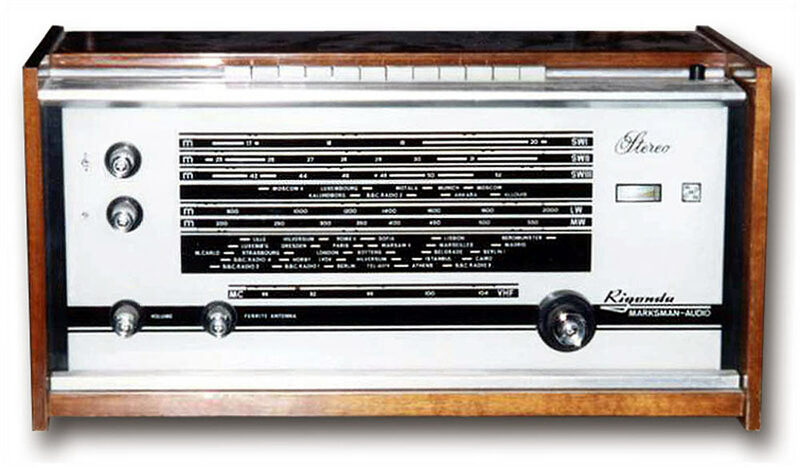 I don't know how many other families in Britain bought a Russian-built Rigonda hifi system but they were advertised in Exchange and Mart, so maybe more than I imagine. It was chunky, as can be seen above, and packed a punch. 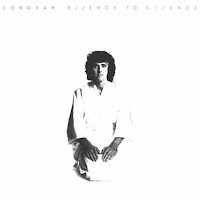 The cassette is now quite disappeared, for reasons too painful to relate here, but I recall listening in my bedroom to a bootleg tape I'd made myself of Donovan's next Glasgow concert in late 1973: very fuzzy, but in the dark, the memory of the gig still vivid, the warmth of that amplifier took me half the way there, as the Bringer of Roses might have phrased it. That accommodation with the limits of the bootlegger's art had been reached too late, however, to reclaim the spurned souvenir of that first magical experience at Green's. I don't think I kept the contact details of my accuser, but even if I did I probably wouldn't have been all that keen to risk further contact. (Come to think of it, I can't remember whether he actually sent me a refund or whether he considered the cessation of telephonic hostilities to be sufficient reward in itself.) And so the years, the decades, went by. The internet, when it finally happened along, didn't offer any immediate revelations. Over the years I would periodically search the web for mentions of a bootleg of the Upper Clyde Shipbuilders concert with no luck - until, that is, a few days ago. I don't know how long the association with the band lasted - he doesn't particularly big them up, jokily claiming he "found them in an Irish bog somewhere" - but even through the murk of the recording there seems to be an additional fillip given to the songs he sings with them, often with a countryish edge. 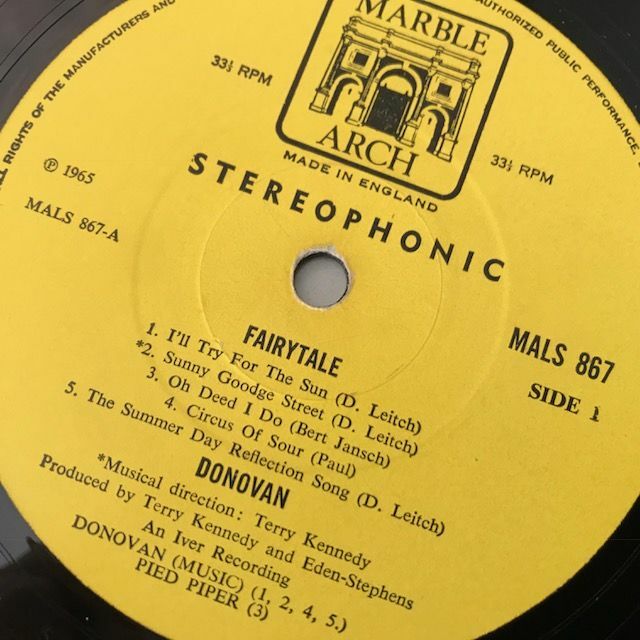 A version of the traditional number The Cuckoo, only recorded in the studio by Donovan many years later, is a highlight, as I was aware at the time, although memory plays strange tricks: I recalled it as being guitar only and coming much earlier on in the proceedings. He revisited several unreleased songs mostly written in the early Seventies, from the early Elvis-style heartbreak ballad "The Loving of You" to the rockabilly stomper "Blue Jean Angel." "Every time I had a look at those songs, from '73-4 up until now, it was always, 'You don't touch those songs. And the only way you're gonna touch those songs is by going back to Nashville.'" 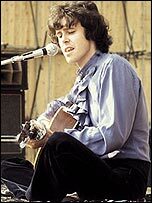 Donovan wrote those songs at a personal crossroads: the Sixties were over, and he drifted from a London mansion ("with a Rolls Royce and a BMW sports car and cockatoos in the garden and a swimming pool") to California. Donovan finally listened to them again last year when he was looking for a special project following his induction into the Rock & Roll Hall of Fame. "I've got hundreds of [cassettes], of course," he says. "They were ready to go. When I played them, it became clear what these songs were doing was something extraordinary." Listening to the bootleg again The Loving of You is, I believe, a waltz. On the 2013 studio recording there's a bit of strain in his voice but it seems to fit with the vulnerability expressed in the song. The lyrics also refer to "the tune of my new moon melody", which makes me wonder when he was attempting to conjure the feel of Presley's strange and fragile recording of Blue Moon for Sun Records. Your Broken Heart, which also sounds countryish, did appear on vinyl not long after the Glasgow gig, on his Japanese-only live album in 1973 and the studio album 7-Tease, recorded in Nashville the following year. Which makes me wonder whether The Loving of You had been tried out during the sessions for the latter album but had missed the cut - unlike Ordinary Family, which had also been sung at the UCS gig, to much hilarity. The turning point came in 1972 with a telephone call to Downing Street from David McNee, Chief Constable of Glasgow. McNee warned the cabinet that if it attempted to use force to end the work-in, he could not guarantee order on the streets of the city. ... the whole field was laughing and yes, Donovan had come right back and won and there was a big sparkly smile on his lips and in his eyes. But I doubt whether it could have had the same impact as on that earlier airing. Above all he knew exactly what he was doing . He was possibly the most together act of the entire festival . There was a sense of neatness, a sense of old time professionalism about him. That certainly ties in with my memories: I recall, more than anything, not wanting the concert to end, aware that a delicious kind of hypnosis was taking place. As with Ben E King, schtick is the wrong word to choose - but as the MM reporter said, he knew what he was doing, what was needed. The single encore at Glasgow is a kind of back-down-to-earth moment after the mildly chaotic fun of Mellow Yellow (as on the officially issued In Concert LP he plays around with the words), but in no sense an anti-climax. You can hear everyone singing along to the chorus, which may have been as poignant for me then as it undoubtedly is now: it's the first track on Side One of that toyshop trinket, the Marble Arch edition of the Fairytale album. And regardless of how I may I feel when I hear Donovan straining to hit certain notes these days, or attempting to conceal his vocal limitations with a shuddering vibrato which can, at its worst, make him sound almost like a cruel parody of his younger self, I must also acknowledge all he has given me over the years: the economy of the songs on Fairytale was my introduction to a kind of poetry - the poetry peculiar to song lyrics, anyway. A slightly sour note to end what had been, nevertheless, an unforgettable initiation into the Wonderful World of Rock Gigs. I'd say the experience of that Sunday afternoon, of being totally caught up in the songs from beginning to end, was rarely equalled and never bettered - and these days, however keen my anticipation, it's almost invariably a case of diminishing returns over the course of an evening. 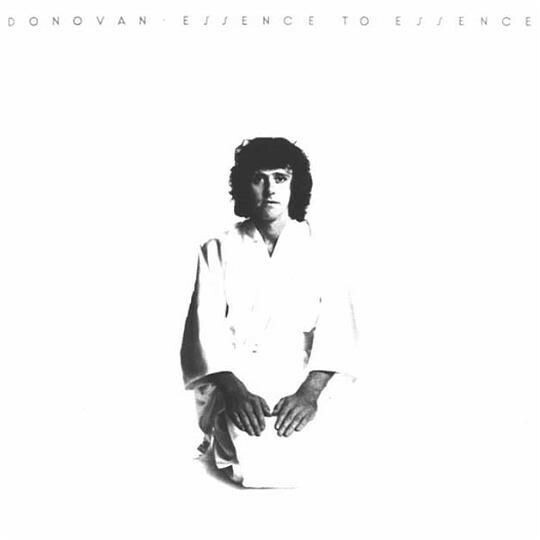 I next saw Donovan in late 1973, around the release of Essence to Essence. This was the occasion when I cut out the middleman and made a tape myself with a little Philips or Sanyo portable cassette recorder, feeding the result through the Rigonda system in my darkened bedroom, the glow from the amplifier the only illumination. He sang a particularly good version of There Is a Mountain, placing an unusual stress on "The lock upon my garden gate's a snail" and, as in 1972, jazzed it up with a bit of falsetto scatting and yowling. Only a Working Man, The Ferryman Her Father and other songs were also played, along with the hits and a generous selection of songs from the new album, produced by Andrew Loog Oldham; as the live Japanese album dates from that year presumably he was match fit by the time of the Glasgow gig in December. I don't know how well it sold - the Essence to Essence LP, I mean, not the bootleg, which I never copied or lent out - but I do recall mentioning it in passing to another student when I was at art school in 1977 and receiving the instant response: "That's a good wee album." It is. I wish I still had that cassette of the '73 gig - but that really is beyond recall. (Don't ask.) A lot of the songs he played that night feature on the Japanese album - which is very well recorded indeed, with absolutely no necessity for any Russian boost - but, as I'm sure many readers will already know, there is something about having a record of a particular occasion when you were there, whatever it may sound like to stay-at-homes. 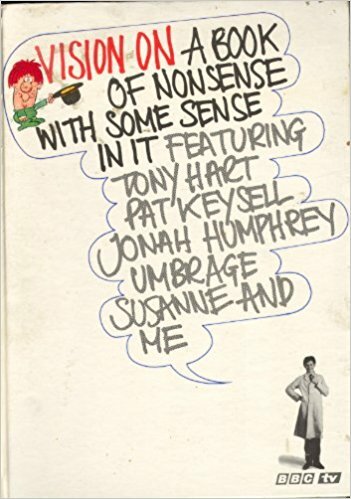 I recall a phrase used by Tony Hart in what I think was the only Vision On book. Praising the best of the paintings which viewers had sent to the longrunning children's television programme he said: "They've used their eyes - and their imagination has done the rest." Imagination, memory and - to some extent - ears must all come into play when approaching bootlegged relics from the pre-digital age. Oh, and being in possession of a vintage valve amplifier from the former Soviet Union don't hurt none neither. 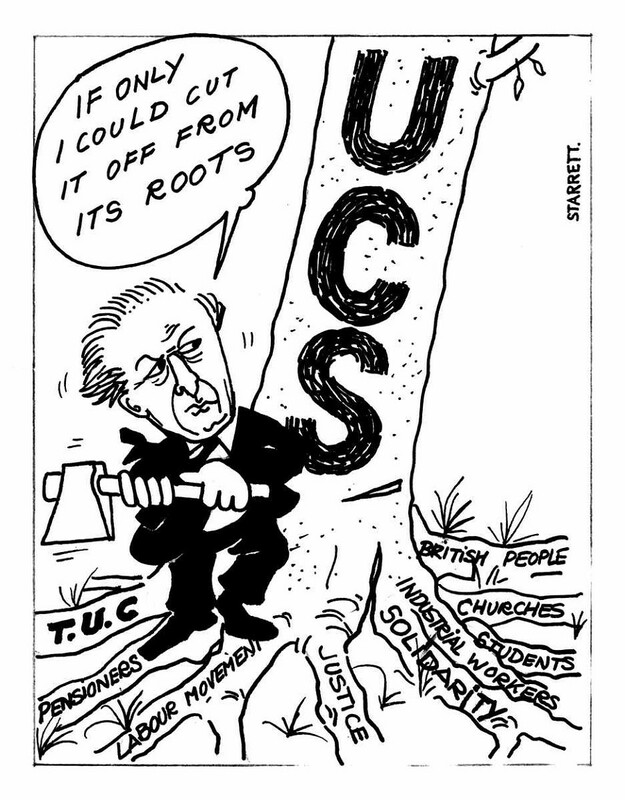 Details about UCS from The Glasgow Story website and "An Introduction to the UCS Crisis" by Ruth Wishart in Jimmy Reid's Reflections of a Clyde-Built Man. Cartoons are by Bob Starrett. Thanks to Doug Holton.